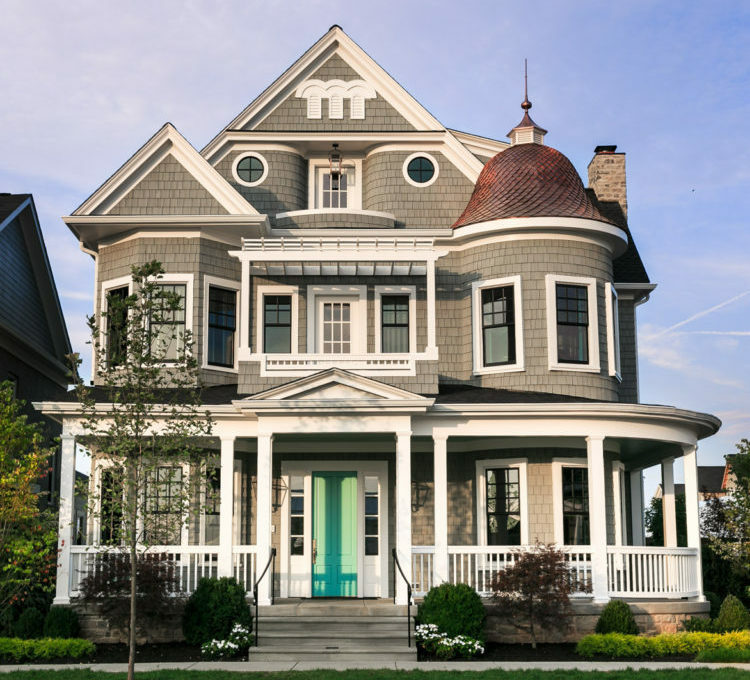 This grand three-story house with the copper-topped turret and wrap-around porch may look like an older home that was updated, but it’s actually brand new. 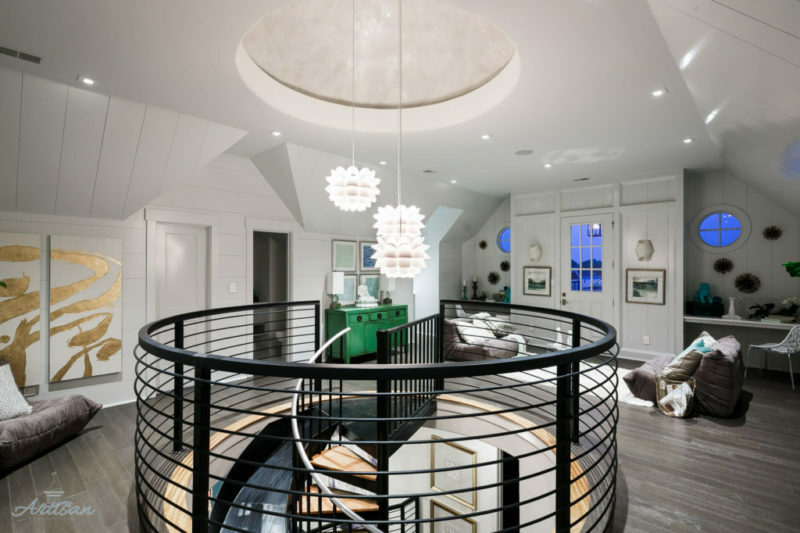 Hampton Pointe was Artisan Signature Homes’ award-winning Homearama entry last year in Louisville, Kentucky, and I was surprised to see how modern it is inside. 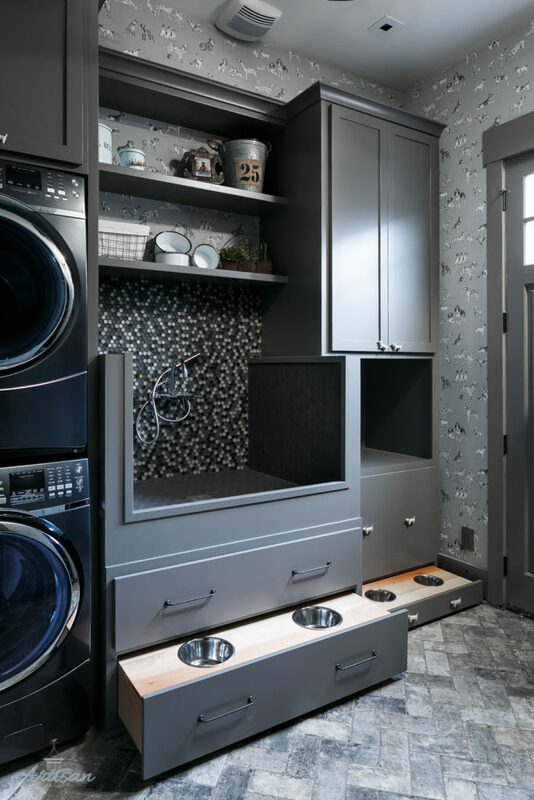 It was designed for a young family with children and dogs, and there are playful details like a slide and a secret door. The wraparound porch with gray cedar shake exterior has a view of a park across the street. Counting the finished basement, the house has four levels and 6,000 square feet. The house has 4 bedrooms, 6 bathrooms + 3 stories. 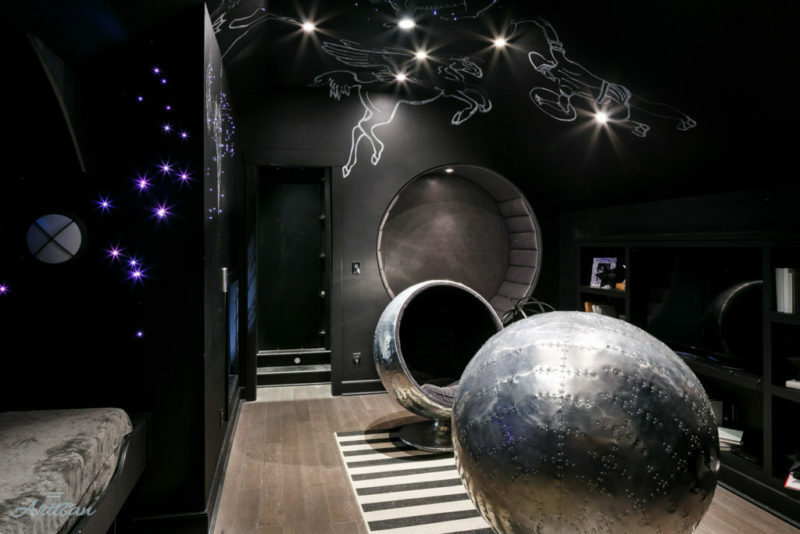 The interior design was done by Marsha Riggle, Jessica Pinnick, Wendy Saladino and Kevin Coleman of Tassels. Norton Commons is a neighborhood in Louisville where the houses are all inspired by classic designs. I normally don’t care for modern interiors, but this one is a real work of art. Warm, beautiful, innovative. Living here must be a lot of fun for the whole family! My favorite thing visually is the copper roof on the turret. The only thing I would change are the views. This house deserves ocean views! The outside is stunning! The inside is a terrible waste of money! It certainly is not my taste, but goodness I appreciate good design and color. Everything works so well together. The couch melts my heart. Wow! What a surprise inside. And beautifully done. My kids would use that slide every time! Thabks so much for sharing! The modern interior took a minute to grow on me, but I can’t help falling in love with how much character this house has. The slide was what really sold me on it. Even as an adult, I’d take that thing down every chance I got! Love the exterior and the attention to detail. The inside leaves me confused. Normally I like modern, but there are too many clashing elements slammed together for my taste. There are some aspects of the kitchen and bath that I like. I’m sure the family this is designed for is happy and that’s what counts, but it’s not for me. I love the exterior. It is beautiful and very nicely done. I don’t care for the interior, but that being said, a house is only a home if the interior reflects the taste of the owners. If the owners love it – it’s perfect. As someone who has an irrational fear of heights, I would never go up to the loft area EVER. 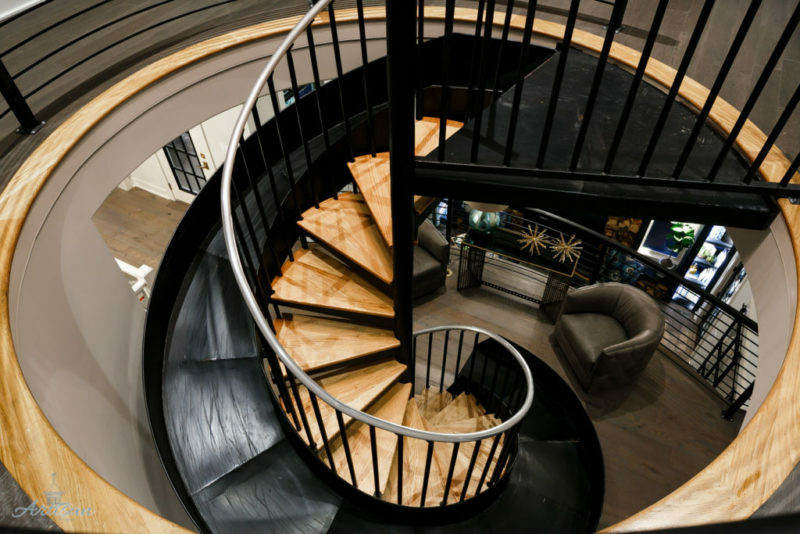 Even looking at the pictures of that tiny triangular landing for the spiral staircase/slide makes me feel ill. I love the hidden room though – so much fun for kids. Really ugly interior. Beautiful exterior. Love the outside but the inside ! Um, Beetle juice lives ! Love the outside. I do feel ( perhaps incorrectly) that insides and outsides should slightly “match” – so this one threw me for a loop. I can’t say I care for the interiors – feels too busy and frenetic. But the outside is magnificent. The outside is superb. But interior is not so good, honestly it’s terrific. I don’t even imagine such an interior in my home. But the exterior is fabulous, really mesmerized. The exterior is very inviting, just what I’m looking for if I can’t find my dream Italiante at a very reasonable price. 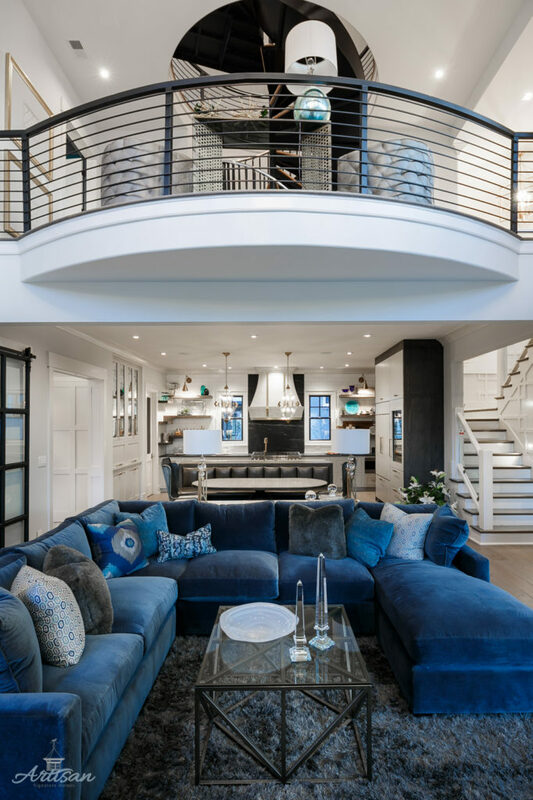 The interior was such a pleasant surprise, a true marriage of “the old with the new!” The Star Wars theme, and slide down the stairs – was waaay off the charts… “someplace we haven’t been before…” Would love to live there, or have the house built near mountains – complete with a view. Can you arrange that? I love this house inside and out. I think they did a fantastic job. What is throwing me off is that it looks like it is located in a subdivision very close to other houses. I was hoping this has a cool location to match everything else. That house certainly has a lot of enviable design features. It looks like they may have favored Restoration Hardware for things like furniture and light fixtures. The only drawback I see is that the screened deck and lower porch open to the two-way view of the neighbors’ back windows. Maybe the shrubs will grow up to hide more in a few years. I don’t have any problem with a stylistic conflict between exterior and interior in modern construction – I would have a problem with it if this had been an intact old house which had been gutted for a radical makeover. Given that the house is in a neighborhood of traditionally-styled houses, the Neo-Victorian exterior makes more sense than a modernist facade would. Both exterior and interior are highly eclectic… they at least have that in common! It’s always good to see new design which has a sense of whimsy! Sad that you are not blogging very often. I always looked for to your blog everyday. Blogging can be very draining and time-consuming. Julia can’t provide constant content without recharging her batteries now and then… her well-being is more important than our amusement. Sorry, Paula. Nice to know I’m missed! I used to look forward to your postings. It saddens me that you barely do it anymore. Wow I love it! The old style exterior with a modern interior works great in my opinion. Great post.